New Orleans Mardi Gras on Royal Street. One of my favorite cities in the world, New Orleans, Louisiana is celebrating its tricentennial this year. Not only is it one of the oldest cities in America (300 years), it's one of the most culturally rich and historically fascinating cities of all time. To help celebrate New Orleans' tricentennial, and rather than give an odd list of what to expect this year, I went through the city's complicated yet exciting history, highlighting a significant event every decade that helped shape the city today. Obviously, this was one of my most research intensive assignments. If you happen to fly American Airlines this month, please pick up a copy of the in-flight magazine, where you'll see my beautiful 9-page spread! You can also click the link here or see below. 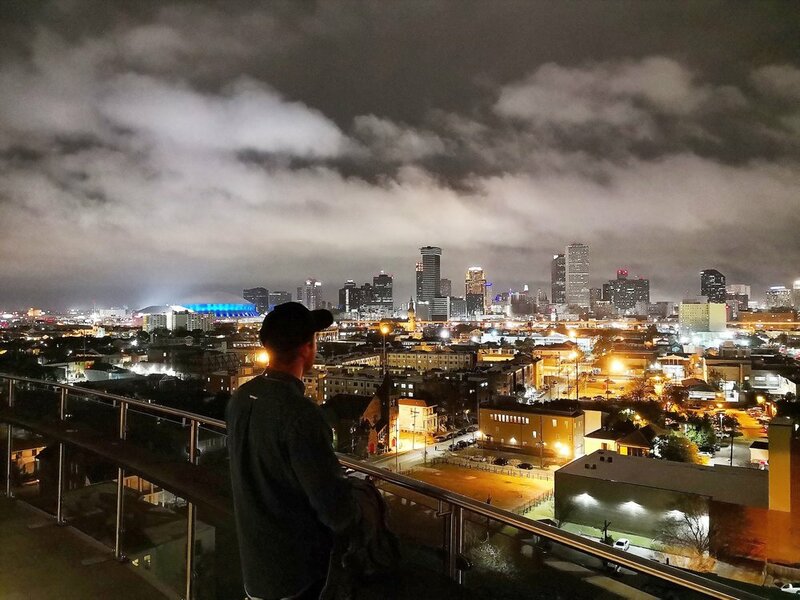 If you're visiting Crescent City, don't forget to do these 4 amazing, mandatory things for the perfect NOLA experience, check out these awesome new hotel bars and, of course, hipster TF out (because it's cool now!). New Orleans by night (from Pontchartrain Hotel). Over the last three centuries, New Orleans has survived hurricanes and fires. 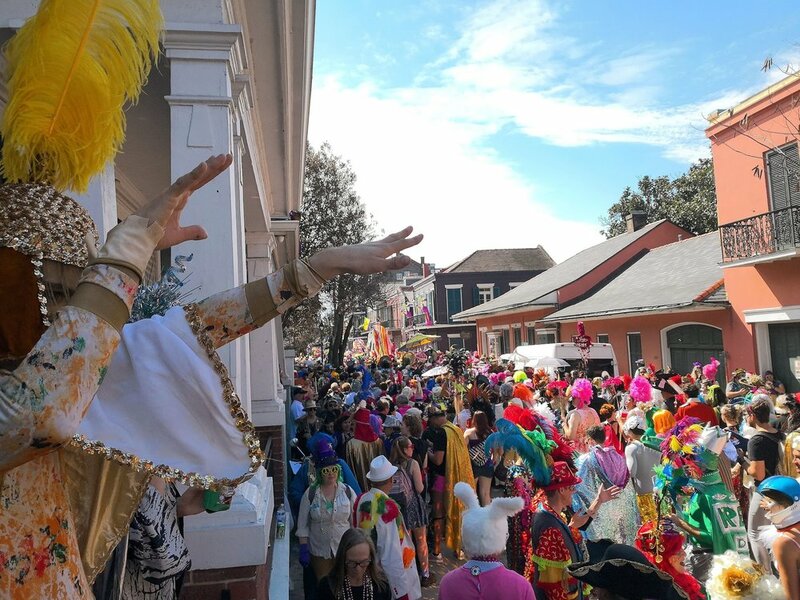 It has been coveted, ruled and swapped by various empires, and enriched by waves of immigrants, cultures and cuisines, not to mention millions of wild Mardi Gras revelers. To celebrate the city’s 300th birthday this year, we take a look back at 30 decades that made the Big Easy one of America’s most storied cities. The French saw an elevated bank along the Mississippi River as an ideal location for a colonial city—it was drier than the surrounding bayou, near Native American trading shortcuts to the Gulf of Mexico and was a safe distance from Spanish and English rivals. In 1718, Jean-Baptiste le Moyne de Bienville, governor of French Louisiana, named the site Nouvelle Orleans in honor of the Regent of France, Philippe II, duc d’ Orléans, nephew of Louis XIV. Though Bourbon Street seems aptly named today, it was not named for the American whiskey, but rather for the Royal House of Bourbon, a ruling family in France, in 1721. That said, alcohol has played a leading role in the story of this colorful, sometimes wild street. Lafitte’s Blacksmith Shop is not only one of the oldest buildings in the French Quarter, built in 1722 and 1732, but also the oldest structure used as a bar in the U.S. Fifty years after it was built, Jean and Pierre Lafitte used it as a base for a smuggling operation. This local haunt for refugees and pirates evolved into a place for sailors and hustlers, and it once served as a gay bar (Tennessee Williams was a customer). Now, it’s one of the most popular watering holes in town, with patrons spilling into the street on the weekends. A Christian holiday with roots in pagan spring fertility rituals, Mardi Gras (or “Fat Tuesday”) spread from Rome to the rest of Europe in the 17th and 18th centuries, eventually reaching the New World. Historians believe the first American Mardi Gras took place in 1699 in rural Louisiana, coming to New Orleans in the 1730s—initially without parades, floats or beads. 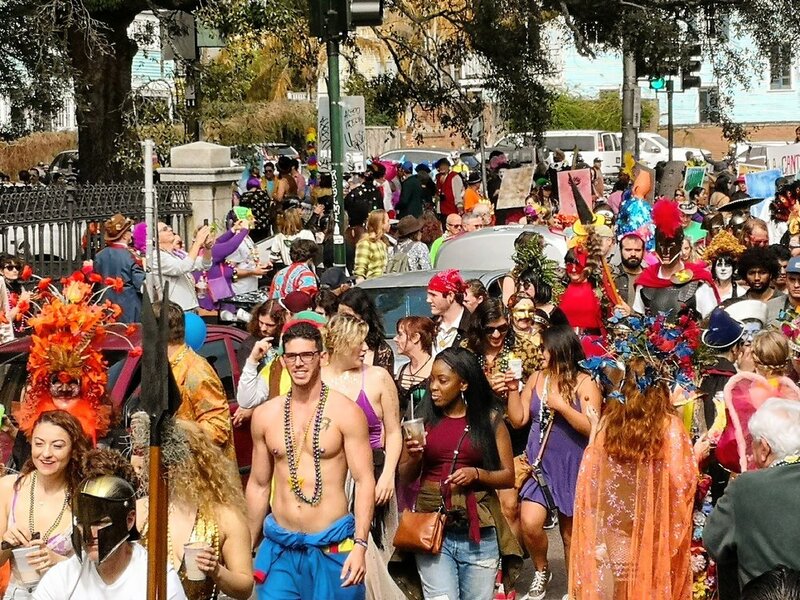 It has since grown into the rowdiest and most famous Mardi Gras event in America. In 1743, Louisiana governor the Marquis de Vaudreuil established elegant society balls restricted to the elite. These private, opulent affairs are today officiated by a handful of secret societies, known as “krewes.” Only five of these exclusive societies existed until the 1900s, but now there are more than 50 “krewes” celebrating a spectrum of themes and cultures with balls and parade floats—though it’s near impossible to be invited into one of the original societies that still exist today. In 1752, nuns from Normandy arrived in New Orleans and established the Old Ursuline Convent, also a hospital and shelter for young girls. Today, it’s a museum filled with centuries-old scriptures, records and drawings, and stands as the oldest French Colonial building in the Mississippi Valley. The long, expensive and confusingly named French and Indian War, pitting the French against the English, prompted France to sign the secret Treaty of Fontainebleau in 1762. The agreement ceded New Orleans to Spain to keep it out of British hands. Though some French and German settlers rallied against Spain in the Rebellion of 1768, the country regained full control in 1769 with the institution of Spanish law. During the American Revolutionary War, Spanish-controlled New Orleans smuggled aid up the Mississippi to the 13 rebel colonies. In 1779, Louisiana governor Bernardo de Gálvez y Madrid overpowered the Brits in the Battle of Lake Pontchartrain, earning an invite from George Washington to attend the 1783 Fourth of July parade. Today, a statue of Galvez stands on Canal Street. On March 21, a candle in a Chartres Street residence sparked one of New Orleans’ worst disasters, the Great Fire of 1788. As the blaze spread, priests refused to ring church bells in alarm, as it was Good Friday. The fire ultimately destroyed 856 of the city’s 1,100 buildings—which led to a Spanish-style reconstruction that produced the beautiful French Quarter. Original buildings that survived the fire, such as the Ursuline Convent and Lafitte’s, contribute to the eclectic architectural mix. In 1794, an all-boys boarding school and orphanage burned down on Royal Street, killing five children. The Andrew Jackson Hotel, built on the very spot, is today popular with both tourists and spirits. There have been countless alleged sightings of bygone boys playing in the courtyard and guestrooms, as well as child laughter in the dead of night. “Armond” is said to be the most active spirit. With the signing of the Third Treaty of San Ildefonso in 1800, Spain handed the colonial territory of Louisiana back to France. The treaty was handled under the radar to avoid provoking an American or British response before French troops could defend the city. Three years later, Napoleon sold the Louisiana territory to the U.S. for $15 million (around $316 million today). The 828,000-square-mile Louisiana Purchase doubled the size of the U.S. In 1811, Charles Deslondes of Haiti led one of the largest slave insurgencies in U.S. history. An estimated 200 to 500 slaves armed themselves with farm tools and marched 22 miles in two days toward New Orleans, burning plantations and crops and chanting “Freedom or Death” along the way. Their goal, according to historians, was to spread the rebellion to the city and establish a black state on the river. The rebellion was brutally quashed. In the winter of 1827, after attending a Mardi Gras parade in Paris, a young Louisianian rallied his friends in New Orleans and led a spirited street procession. As the tradition evolved over the years, revelers donned masks, rode on carriages and horseback, dressed in colorful costumes and generally kicked up their heels. The march would eventually become the New Orleans Mardi Gras street parade, the city’s largest and most raucous celebration. The Garden District, with its large, lavishly decorative mansions and lush green spaces, rapidly developed. In 1833, in the center of it all, the city established the famed Lafayette Cemetery, with above-ground tombs. Imbibing took an upturn, too, as Haitian immigrant pharmacist Antoine Peychaud created America’s first cocktail, the Sazerac, in 1838, by mixing his family’s bitters with Cognac for customers. Later recipes swapped Cognac for American rye. In 1840, Antoine’s, NOLA’s oldest fine-dining restaurant—famous today for high-end French-Creole cuisine—opened as a bed and breakfast run by Antoine Alciatore and his wife. In 1868, the family moved it to St. Louis Street, where it stands today. After decades of hidden ceremony, in 1857 the Mistick Krewe of Comus became the first secret society to host a public Mardi Gras parade, flaunting its king and queen on an elaborately decorated float. Other krewes followed suit and a new tradition was born, leading to the formation of a slew of additional organizations. Originally opened as a humble coffee stand across from Jackson Square in 1862, the still-beloved Café du Monde gained popularity with its beignets. The pastry evolved from Spanish sopapillas, getting a dusting of powdered sugar, as cane was abundant along the Mississippi River. Voodoo (or vodou) took root in New Orleans in the 1700s via the slave trade. Over the years, voodoo queens became powerful local figures. In 1874, Marie Laveau II, the most influential, held a public rally at Lake Pontchartrain, attracting 12,000 New Orleanians, both white and black. The event is still talked about today. Abby Fisher, a professional chef, began her rise to prominence, eventually becoming one of the first African Americans to publish a cookbook, What Mrs. Fisher Knows about Old Southern Cooking. Among her recipes are ochre gumbo and jumberlie (jambalaya), which put New Orleans Cajun and Creole dishes on dinner tables across America. In the late 1800s, brass bands and ragtime piano were popular, while poor NOLA neighborhoods added a West African/Caribbean touch to local music. From this mix emerged Charles “Buddy” Bolden, a cornetist who formed a group in 1895, fusing these influences with blues, black Baptist music and his own legendary improvisations—in effect, inventing jazz. Sadly, Bolden entered a downward spiral, culminating in his admittance to a mental institution at age 30, where he lived until his death in 1931. Sicilian immigrant Salvatore Lupo, founder of Italian-American grocery store Central Grocery, created a special sandwich in 1906 for Sicilian workers in the French Market who missed homemade Italian grub. He piled the submarine-style sandwich with salami, ham, mortadella, provolone, marinated olive salad and a secret sauce. So began the famously calorific muffuletta sandwich—still a favorite among the Big Easy’s big eaters. Surrounded by bayous, Lake Pontchartrain and the Mississippi River, New Orleans often suffered from flooding and attendant diseases, such as yellow fever and malaria. In 1913, engineer Albert Baldwin Wood invented the 12-foot screw pump to push floodwater over levees into Lake Pontchartrain. The American Society of Mechanical Engineers declared the system a Historical Mechanical Engineering Landmark in 1974. New Orleans thrived in the 1920s—jazz flourished and cool streetcars shuttled people around. Affluent visitors in particular had a ball. The Orpheum Theater opened in 1921, and the Roosevelt Hotel was redesigned and renamed in honor of President Roosevelt in 1923. There was a boom of hotels with ballrooms (including LaSalle Hotel, The Hotel New Orleans and The Jung Hotel), along with high-end dining (Commander’s Palace, Antoine’s, Galatoire’s and Arnaud’s). The state amended its constitution in 1936, empowering the Vieux Carré Commission to preserve the French Quarter, making it the nation’s second legally protected major historic district (after Charleston, South Carolina). The effort paved the way for future tourism and, of course, allowed locals to keep their loveliest neighborhood. In 1938, Tennessee Williams moved to New Orleans, where he wrote the play A Streetcar Named Desire, set in the French Quarter. As tourism took off, locals Clem and Violet Lauga had the brilliant idea of offering carriage rides through the French Quarter. They bought a horse and cart from Aunt Sally’s Pralines and started selling rides in 1941. The carriages, now using mules, are a popular way to explore the Quarter. Sicily roiled with political turmoil after World War II. Many citizens fled to the U.S., where Italians had been immigrating since the late 1880s. A burgeoning New Orleans, in need of unskilled labor, welcomed them in droves. Inside the Bayou Bar, the Pontchartrain Hotel’s divey pub, the New Orleans Saints officially signed into the NFL in 1966. The bar’s football legacy continues today, as Cooper Manning (son of former Saints quarterback Archie, brother to Peyton and Eli) reopened this sacred Saints space in 2016. You can order Mile High Pie (layered vanilla, chocolate and peppermint ice cream), just as fans did in the ’60s. In 1970, the first New Orleans Jazz & Heritage Festival debuted as a relatively small-scale soiree in Louis Armstrong Park, attracting a mere 350 attendees. (It’s said there were more people on stage than in the audience.) The festival has since become one of the city’s major annual events, attracting half-a-million-strong crowds and musical acts like Mumford & Sons, Harry Connick, Jr., Stevie Wonder and Usher. Tickets in 1970 cost $3. Today, they’re $80. In 1972, meanwhile, Southern Decadence kicked off as a gay house party where guests dressed as their favorite “Southern Decadent.” Today, the Labor Day shindig attracts more than 210,000 participants. These days, the French Quarter Festival pulls crowds of 750,000-plus for four days of live music, food and partying, but the event had fairly inauspicious beginnings. The inaugural fest, in 1984, was held to celebrate the completion of 14 weeks of annoying road construction. There were breakdancing competitions and, surprisingly, Ed McMahon guest-hosted a battle of the bands. Only a few hundred people attended. Times have changed, and the roads are holding up (mostly). Culinary celebrity Emeril Lagasse opened his first eatery, Emeril’s Restaurant, in the Warehouse District in 1990, followed by NOLA, Emeril’s Delmonico and Meril. The city saw some literary action, too. Anne Rice’s Interview with the Vampire became a blockbuster movie in the mid ’90s, steering droves of tourists to the Garden District. Category 3 Hurricane Katrina hit the city on August 29, 2005, with winds up to 125 mph and a 20-foot storm surge, flooding 80 percent of the city and resulting in 40,000 people being quarantined in the Superdome and the Ernest N. Morial Convention Center for five days. In Louisiana, 1,577 people lost their lives. Relief efforts were monumental, with more than 1 million volunteers flocking to New Orleans to help rebuild the city. NOLA has been on the rebound—there were around 800 restaurants here before Katrina; now there are 1,400. Beyond this year’s tricentennial happenings, NOLA’s historic Spanish Plaza on the riverfront will see a much-anticipated $7-million facelift, and the city is springing for a $37-million state-of-the-art ferry terminal. This year offers myriad ways to celebrate and get to know what makes NOLA NOLA. The Historic New Orleans Collection, a museum and research center that spans 10 historic buildings throughout NOLA, adds a third campus, this one in the French Quarter, inside the 19th-century Seignouret-Brulatour House, opening this fall. “Art of the City,”a retrospective of contemporary art from the 1984 World’s Fair to today, kicks off the opening of the new campus. “New Orleans, the Founding Era,” an exhibition exploring the first few decades of NOLA and its earliest inhabitants, runs until May in the collection’s current main location. Public art installations spike this year, including art star Kara Walker’s Kataswof Karavan, a contemporary sculpture of a steam calliope akin to those used on river steamboats. The Tricentennial Symposium, March 8-11, explores 300 years of NOLA through lectures and cultural programming. Tricentennial Navy Week, April 19-25, sees U.S. Naval vessels and tall ships from around the world dock in town, where the public can tour them all week. Bourbon Street is undergoing a $13 million facelift to amp up security, fix sewer lines and repave the road. It’s the first time Bourbon Street’s infrastructure has been fully reconstructed since 1928. Though Hurricane Katrina was destructive, it also fostered a lasting sense of humanitarianism in New Orleans, as seen with the “Cajun Navy”—Louisianians who headed west with their boats to help out in Texas after last summer’s Hurricane Harvey caused $180 billion in damages. And then there’s former Saints player Steve Gleason (pictured above) and his ALS support foundation, Team Gleason. After Hurricane Maria decimated Puerto Rico, ALS patient Carmelo Diaz was stranded and in need of medical care. The situation was so dire that Diaz’s wife had to power his ventilator with car batteries to keep him alive. Gleason, who formed Team Gleason after he was diagnosed with ALS in 2011, heard of the situation and contacted a friend at American Airlines for support. The next day, with the help of Donald Silkwood, general manager of American Airlines’ station at Cleveland Hopkins International Airport, Team Gleason made their way to Puerto Rico, escorted him with American Airlines staff to the airport, flew him to New Orleans with his wife and arranged for his treatment at Ochsner ALS Center. Today, Diaz is alive and well, and so is New Orleans’ spirit of camaraderie in the face of tough times.